Although often caught up in the daily grind of MIT coursework, the Chinese students were also actively involved in extracurriculars, which they considered just as essential to their American university experience. The students participated in a host of activities, ranging from professional societies to athletics, theater, the rifle club, the wireless club, the Cosmopolitan Club, the Walker Society, and the Institute Committee. Many assumed leadership roles in these groups, and a number became prize-winning athletes or debaters. Chinese Students' Club, 1923. Technique 1924. Image courtesy MIT Archives and Special Collections. The influx of Chinese students in the early years of the 20th century enabled the formation of the MIT Chinese Students’ Club (CSC), which was founded on April 10, 1910, with ten members. Under founding officers YT Tsai (Class of 1910, Mining Engineering), TT Sun (Class of 1911, Mining Engineering), FC Seetoo (Class of 1914, Naval Architecture), and SY Chen (Class of 1913, Naval Architecture), the club was established to offer mutual support "for a group of students coming from different localities in China, studying together in a school several thousand miles away from the homeland," and to promote "good fellowship" with other student organizations. By 1930, there were 35 members of the club, including both undergraduate and graduate students. Activities included: social meetings; Double-Ten (the Republic of China National Day), New Year, and Spring Picnic celebrations; promotion of athletic activities; and maintenance of the "Chinese Shelf" in the MIT Library. The club engaged in various activities with other Chinese Students' Clubs, and enjoyed friendly rivalries in sports and debate. In November 1911, CSC's debate team proudly defeated their Amherst counterparts, taking the affirmative stance on: "Resolved That Industrial Development Is More Important for China Than Military Achievements." The "Technology" contingent at the 18th Annual Conference of the Chinese Students' Alliance, Eastern Section, Ithaca, New York, September 7-14, 1921. 19 MIT students were in attendance. Beyond MIT, CSC members were very active with the Chinese Students of Greater Boston through the 1920s and 1930s, and also participated in the national Chinese Students' Alliance, many taking leadership roles in this important organization. MIT students also took leadership positions in other key Chinese student organizations such as the Kuo Fong Hui (National Defense League) founded by MIT and Harvard students, and The Chinese Students' Christian Association. MIT Technique 1915, p. 310. Image courtesy MIT Archives and Special Collections. 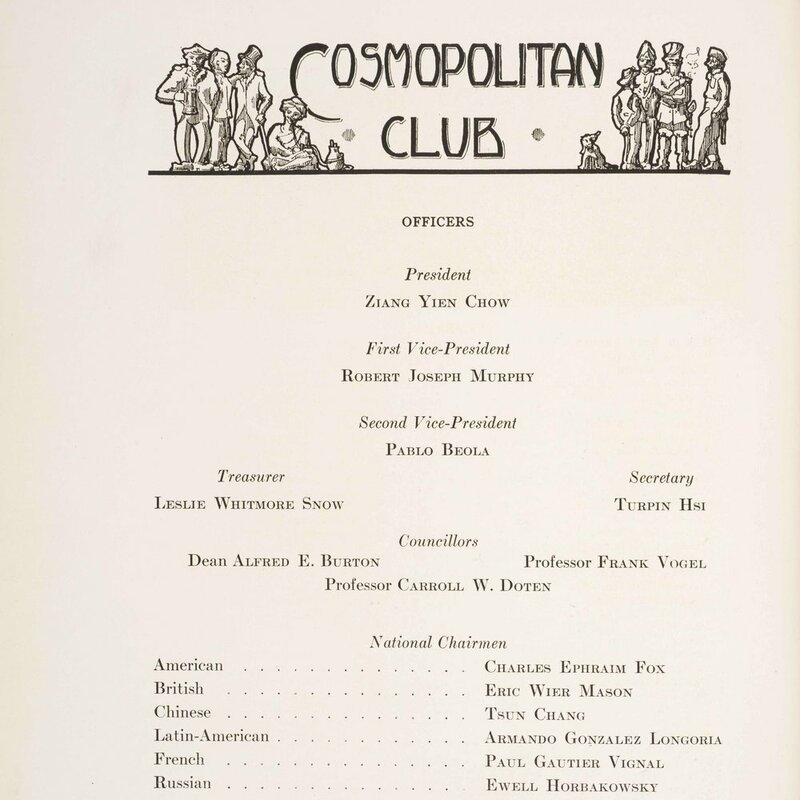 Chinese students also played leading roles in founding MIT's Cosmopolitan Club, established March 1, 1910, with HT Shen (Class of 1909) first vice-president. Dedicated to promoting the ideal of cosmopolitanism, or "world citizenship," the club also aimed to provide support and fellowship for international students at MIT. "Chinese Night" became a popular annual club entertainment. The club was part of a nationwide movement of cosmopolitan clubs on American campuses. Tech Show 1914, “A Royal Johnny,” Tech Show program, AC 299 b.2. Image courtesy MIT Archives and Special Collections. FT Yeh (Class of 1914) played the part of Ziang, Valet to Prince Paul. Theater was another passion of the Chinese students. Several students participated in the annual student Tech Show, and many also took roles in organizing and performing Chinese plays (both in Chinese and English) for groups such as the Chinese YMCA or the Chinese Students of Greater Boston. Music was always a feature of student gatherings, and a number of the MIT students were known for their musical talents, on Chinese or Western instruments. Seetoo Fucheng (Class of 1914) went on to become a famous violinist. Perhaps no other student was more active in theater and music than Ku Yu Hsiu (Ku Yiqiao), who wrote and adapted several original plays -- some in Chinese, others in English -- during his student years at MIT, in addition to composing music. Many of these plays had patriotic themes, including one on the legendary assassin Jingke, which Ku wrote in a burst of creative and patriotic energy, working for 24 hours straight to complete the draft. Chinese Soccer Team from MIT Technique 1920. Image courtesy MIT Archives and Special Collections. A good number of the Chinese soccer players, including captain Sung Sing Kwan (Class of 1919) had played at Phillips Academy Andover during their preparatory school years, while a few others had been champions back in China. In the 1920s, several played also for the MIT freshmen or Institute soccer teams. Arthur Sun (Class of 1925) was captain of the MIT soccer team in 1924. SS Kwan was also a track star, and went on to play an important role in promoting amateur athletics and the Olympics movement in China. Image from cover of Ku Yu Hsiu's "Jingke" (HYL 5719 3881.42A) courtesy of Harvard University Libraries. Theatricals in particular served as an important vehicle for teaching American audiences about Chinese culture, and were also vital for student fundraising efforts for various causes. In 1920, for example, MIT students joined with other area students in the annual end-of-the-year celebration for the Chinese YMCA, with musical performances and a theatrical adaptation of the "Weaving Maid and Cowherd" story. Over 450 people gathered for this event. 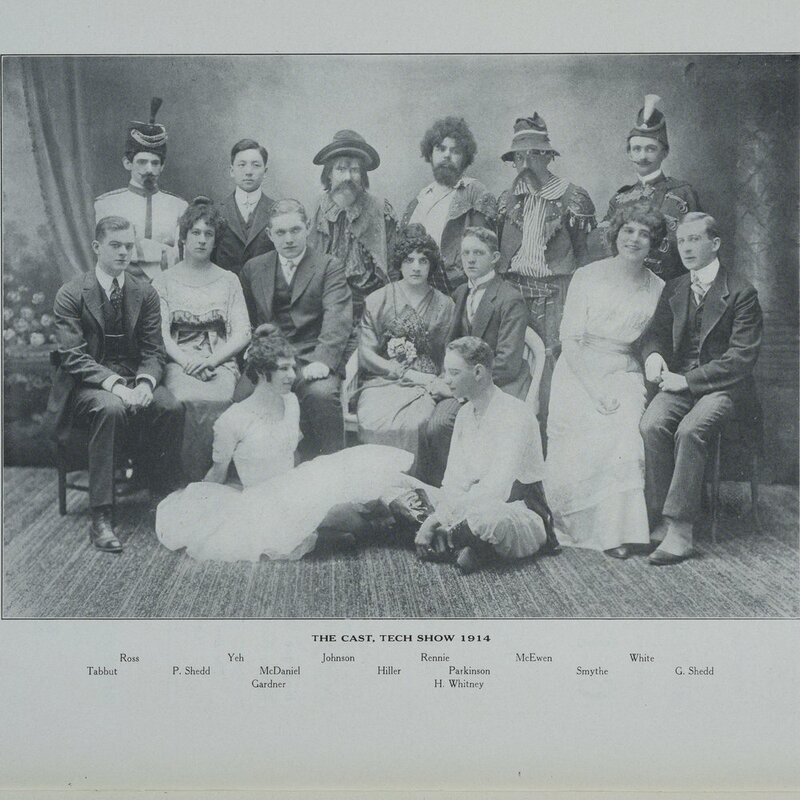 In 1921, when the MIT Chinese Students’ Club launched a Famine Relief Fund Committee in response to the North China famine, their fundraising efforts centered on two plays. The first was performed for the Chinese Merchants of Greater Boston in January 1921. Attracting large audiences for two successful performances, the club raised over $1000 for famine relief. This was followed by a pantomime performance of "Dream of the Red Chamber" for an American audience at Symphony Hall in Boston, put on by the Chinese Students of Greater Boston under the auspices of the New England Committee for China Famine Relief. This event raised over $5000. Sidney Y. Chen, MIT Senior Portfolio 1913. Image courtesy MIT Archives and Special Collections. The Chinese and Chinese American students participated in virtually every professional society at MIT, from the Aeronautical Engineering Society, to Architectural, Civil Engineering, Chemical, Electrical Engineering, Mechanical Engineering, Mining Engineering, and Naval Architectural, and also joined the Engineering Corps and ROTC. Whereas some Chinese students found themselves a distinct minority in a given society, in other cases, the Chinese students were quite prominent. In 1912, for example, nearly half (6 out of 14) of the members of the Naval Architectural Society were Chinese, and Sidney Y. Chen (Class of 1913) was elected vice-president (Technique 1913, 276). Chen was succeeded in the position by Hou-Kun Chow (Class of 1914) the following year (Technique 1914, 286). Many of MIT's Chinese students over the years joined the FF Fraternity, the oldest Chinese fraternity in the US. Founded in 1910 in order to "provide fellowship among fellow Chinese and to provide service to man and country," FF Fraternity proclaimed its originality in the use of non-Greek letters – "FF" stands for "Flip Flap." Other Chinese fraternities included Alpha Lambda, Cross and Sword, Rho Psi, and Phi Lambda, but FF became the predominant Chinese fraternity on the East Coast. The fraternity's motto is "Fellowship and Service." The Chinese name for the fraternity, Lanji 蘭集, literally "gathering of orchids," has its roots in various Chinese sayings pairing gold and orchids and may be traced back to the notion of 義結金蘭, connoting a strong brotherhood of good friends (gold and orchids), and 爾我同心曰金蘭，朋友相資曰麗澤, "When hearts and minds meet, it is as precious as gold and orchids. When friends help each other, it is true beneficence." Frank FT Yeh (MIT Class of 1914) and Sung Sing Kwan (MIT Class of 1919) were charter members. Other early members included Turpin Hsi (MIT Class of 1914),TC Hsi (MIT Class of 1915), PY Loo (MIT Class of 1916), and William Ding Moy (MIT Class of 1920). Frank C.Lin. Technique 1927. Courtesy MIT Archives and Special Collections. "I enjoyed the ball game [at Andover] very much, and I was just in time to catch the last train to Boston after watching the celebration. My ears and my eyes have not been so excited for a long time, for such spirit does not exist in Tech. One good thing is that they keep us working, and we forget everything else." (Frank C. Lin to A. Stearns, June 8, 1924, Box 28, Correspondence with Chinese Students, Office of the Head of School (Stearns), Phillips Academy Archives & Special Collections, my emphasis). Extracurricular activities further provided opportunities for the early Chinese students at MIT to imbue democratic ideals and foster a strong sense of fellowship with other students that contributed to Sino-American understanding. Notes: Many of the athletes had prepared at Phillips Academy Andover, whereas the champion debaters largely came from Williston Seminary. Sources: Chinese Students' Monthly (CSM) vol. 12.3, June 1917, p. 433, Ku Yiqiao, One Family--Two Worlds. Philadelphia, Pa.: 22G Academy House, 1420 Locust St., Philadelphia, 1982, Chinese Students Directory: For the Past Fifty Years, n.p. : Cambridge, Mass., MIT 1931, The Technique, 1904-1931, MIT Senior Class Portfolio, 1908-1915, Chinese Students' Monthly (CSM) June 1910, volume V, number 8, p. 529, "Tech Chinese Receive Banner: Symbol of Recent Debating Victory over Amherst Arrives," The Tech, November 18, 1911, p. 2,"Technology Chinese Receive Symbol of Their Recent Victory," The Christian Science Monitor, Boston, Massachusetts, November 17, 1911, p. 5, "Chinese Students Win Debate," Technology Review, Volume 13, No. 9, December, 1911, p. 620, The Tech, vol XXIX, no. 104, March 2, 1910, The Tech, April 23, 1910, volume XXIX, no. 145, The Tech, volume XXXII, no. 59, December 16, 1912, The Tech, vol. XXXIII, no. 87, November 28, 1913, The Tech, volume XXXIII, no. 89, December 1, 1913, "Star Technology Chinese Soccer Team," The Tech, November 30, 1918, p. 2, The Philippian, vol. XL, no. 1, October 11, 1916, 3, Chinese Students’ Monthly, volume X no.7, May 1914, 562-3. "CHINESE FETE." Boston Daily Globe (1872-1922), Apr 25, 1914, "SETTINGS FOR CHINESE PLAY." Boston Daily Globe (1872-1922), Mar 09, 1915, "Will Repeat Chinese Play." Boston Daily Globe (1872-1922), Mar 08, 1915, Christian China (journal of the Chinese Students' Christian Association in North America, renamed Feb. 1920), volume 6.7, May-June 1920, 454-455, CSM, 16.4, 300-301, CSM 16.7 533, Weili Ye, Seeking Modernity in China's Name: Chinese Students in the United States, 1900-1927, Stanford: Stanford University Press, 2001, 顧一樵, Gu, Yiqiao, 荊軻 : 四幕劇 Jing Ke : si mu ju, 重慶 : 商務印書館, 1940, Chongqing: Shang wu yin shu guan, 1940, Gu, Yiqiao. Shui Mu Qing Hua, Beijing: Qing hua da xue chu ban she, 1994. Wan, Edward I. 2003. History of F.F. Fraternity: Evolution of the First Chinese Fraternity in the United States (1910-2002) = [Ji lan]. U.S.A.: s.n. ].